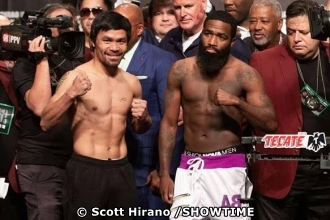 World Boxing Association (WBA) welterweight champ Manny Pacquiao and his challenger Adrien Broner both made the contracted weight for their title match tomorrow night at The MGM Grand Garden Arena. Pacquiao was a lean 146 pounds while Broner was a trim 146.5 at the official weigh-in held at the same venue of their bout. Buoyed by the support of his countrymen who traveled from the Philippines and parts of the continental United States, Pacquiao was all smiles during his brief appearance in the stage. “I’m happy to be back here and I’m happy to be fight tomorrow night,” expressed Pacquiao who turned 40 years old last month. Asked about his age by Showtime’s Jim Gray, Pacquiao who is fighting in the 70th bout of his legendary career stated that he feels young despite being 40. On the other side of the stage is a challenger who is eleven years younger than Pacquiao. Broner, who is also a multi-titled champ like the Filipino icon is looking to pad his resume with the biggest win of his career if he beats Pacquiao in their 12 round title duel. “After I win tomorrow night, I’ll be legend overnight.” remarked Broner who is confident he will make pull the upset. Broner is a +230 underdog to his 40 year old opponent. Pacquiao is at -280, up from -250 when the fight was first announced in November of last year. Pacquiao vs. Broner is the first boxing mega event of the year. It is also the first Pay-Per-View (PPV) offering of any network in 2019. In the sport of boxing, a PPV is a gauge on how big an event is. The telecast starts at 6 o’clock in the evening from Las Vegas, Nevada.